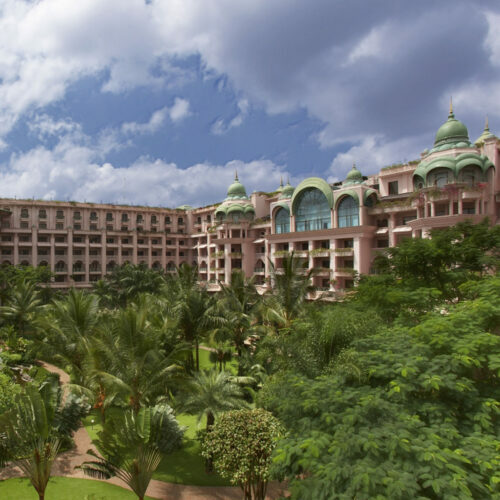 Drawing inspiration from the architectural style of the Royal Palace of Mysore, The Leela Palace Bangalore stands majestically in seven acres of lush gardens and a sparkling lagoon in the garden city of Bangalore. 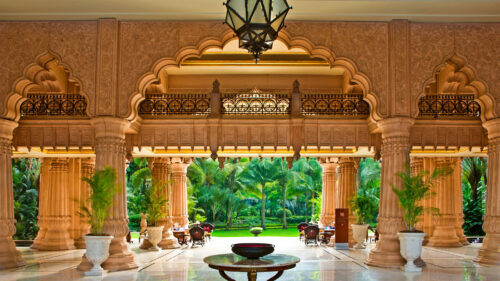 Never failing to impress, from the moment you enter the reception portal, the Leela Palace Bangalore, is a feat of modern architecture with its soaring marble columns and pink sandstone throughout. 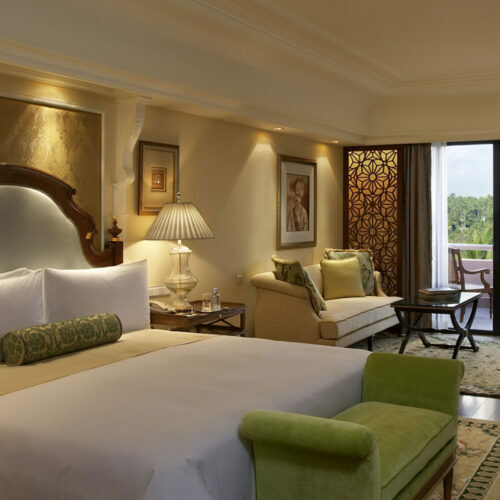 There are 257 luxurious and spacious guestrooms and suites, all starting from 550 sqft, and equipped with the latest technology and spacious bathrooms. Reside in a Club Room and enjoy a wealth of additional extras from the exclusive Club Lounge, to personalized butler service. 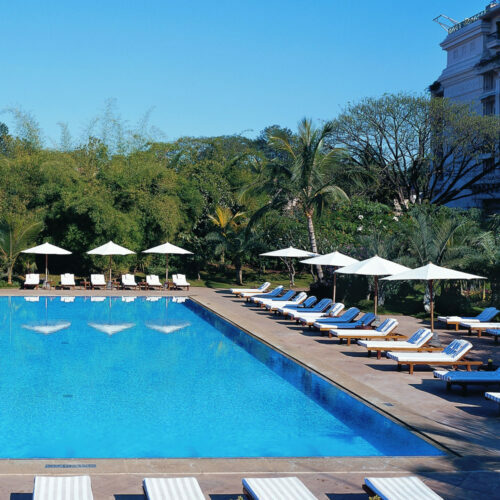 Here you will find a multiple of dining options and extensive banqueting and conferencing venues, providing ideal amenities for even the most discerning traveller. The fine-dining restaurant Jamavar at The Leela Palace serves authentic regional cuisine such as Kannadiga cuisine, a Bengaluru local specialty. There are also proud variants of South Indian dishes—from crispy dosas and other rice-based dishes that are savoury or sweet to the distinctive regional filter coffee. The hotel boasts a luxuriously designed spa with sauna, steam and an inviting whirlpool alongside a state of the art fitness center. Within the pretty garden setting you will find the outdoor 50ft swimming pool, surrounding by inviting daybeds. 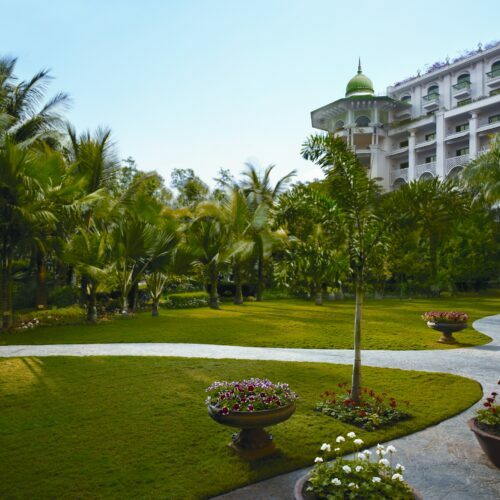 There is a yoga pavilion where complimentary daily yoga sessions are held, surely the perfect start to any day. For those who can’t resist a bit of retail therapy, experience the welcoming boutiques and shops at The Leela Galleria. 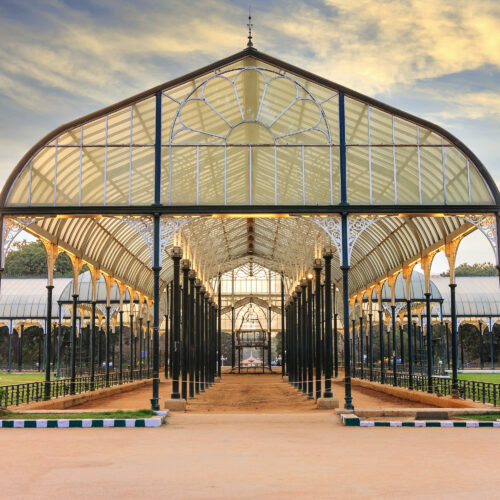 Bengaluru was the erstwhile summer city of Tipu Sultan, who decided to create his summer palace amidst its beautiful blossoming trees and avenues. With the IT boom and burgeoning international status, the ‘garden city’ soon became the ‘silicon valley’ of India. Considered one of India’s youngest cities, walk around the avenues, markets, cafes and take a stroll in one of the numerous parks in the city such as Cubbon Park, JP Park or the Lalbaugh Botanical Gardens.